At ACHEMA KROHNE introduces the re-newed OPTIFLEX range of TDR level transmitters. Just like the OPTIWAVE portfolio of 6…80 GHz radar level transmitters was re-newed in 2017, the TDR series comprises six devices, each specifically designed for a certain area of application. 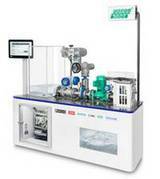 To demonstrate the use and possibilities of PROFINET for ACHEMA visitors KROHNE set up a joint demonstration model together with PhoenixContact and other industrial partners. PROFINET is currently available for all x400 OPTIMASS Coriolis flowmeters and for all x300 OPTIFLUX electromagnetic flowmeters. Together with it's partners KROHNE offers also instrumentation and control solutions for Oil & Gas, a chemical batch reactor and the possibilities for wireless remote data transmission from remote measuring points.